"This is an old Portuguese recipe that my Vovo taught me how to make. It is great for the typical huge Portuguese family party or reunion, it is a very light meringue cookie, it is very simple, but I insist that you use an electric egg beater. This is very sweet, and has a hint of citrus flavor to it. If you don't use an electric egg beater, it will take you hours to prepare it!" This recipe as some already have stated, is not made with the "Whole Egg" just the "Whites". 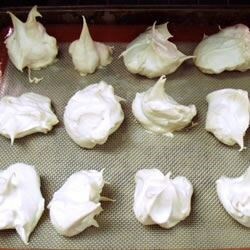 It is a awesome Meringue Cookie if don't properly. Only use the egg whites, not the entire egg.